MS2 - A Traffic Jam of Engineers? A Traffic Jam of Engineers? Like many successful software and engineering firms, MS2 is out looking for new traffic engineers and software programmers to join our staff. We've added two new bright young people to our programming side from the University of Michigan recently. But we are still looking for traffic engineers to join us and assist with project management tasks. The shot above shows the madhouse of engineers (all sorts from civil to mechanical to computer) at a recent career day at the University of Toledo in Toledo, Ohio. 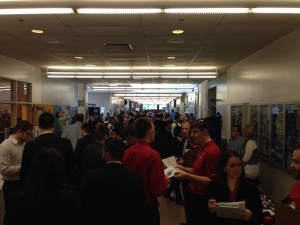 Over 140 employers were there seeking new employees. If you are a traffic engineer and have an interest in project management, please contact us through our website under the tab "About Us".